I love wool! Especially felted repurposed wool that has lovingly been upcycled into a creative piece. I have been delighted to find inspiration on Pinterest for various felted wool projects. I hope to do a feature on the various felted wool projects that have caught my eye. For those of you who love the thrill of a thrift store find you’ll enjoy reading a series that I am planning on Upcycled gifts made from repurposed wool. 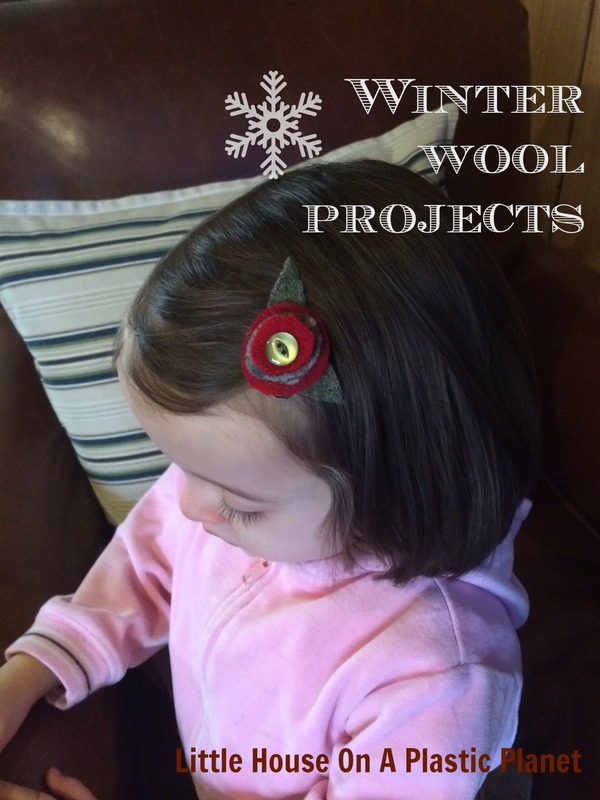 Here is the first project: a hair barrette clip upcycled from felted wool remnants. The wool came from a sweater with holes obtained at a thrift store. The pieces were leftover from making wool diaper covers for our youngest earlier this year. 1. Begin by cutting circles of various colors are wool. I used (3) circle layers of red and variegated grey wool. 2. Cut (2) leaves from green wool. I chose to embroider a running stich down the green wool as veins in the leaves using a shade of green embrodiery thread. 3. Layer your circles in order by size largest on bottom and smallest on top. Place your button on the top of the smallest wool circle and sew your button through all the circular layers of wool. 4. After sewing the button on, attach your leaves behind the large circle using your matching thread. 5. Lastly, using your hot glue gun to attach the hair clip to the back of the leaves. My next post in this series will be upcycled felted wool pot holders.